Online resource to prepare ACT test! ACT is one of the premier college admissions examinations in USA. Every year millions of students take part in this test. In general, high school students should have either ACT or SAT score to prove academic skills when applying for universities or colleges. ACT isn’t English test alone, however, three of its five sections focus on language level, they are English, reading, and writing. So if you are trying to enter top universities and are preparing ACT test, you must concentrate on improving English ability to match with ACT test style. Language skill can be shown or tested in multiple aspects and each language test has own convention and style. 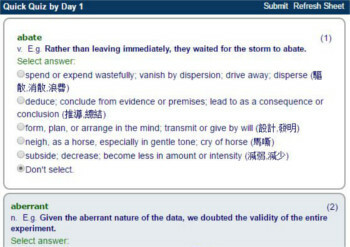 ACT's language tests have no exception. To prepare ACT tests, the shortcut is to work with sample questions from official organization. This website doesn't offer ACT test samples and exercises. It collects resources for ACT vocabulary builders and hosts lots of online materials for students to review and study ACT vocabulary, such as word lists, practices, apps, tips, and experiences. Powered by modern information technology, it not only shows word lists or other contents statically, it also provides interactive online exercises to help test takers build ACT words easier and quicker. Some people think vocabulary isn't important in ACT test. But as we know, word is the foundation of language. Although ACT argues that it doesn’t test difficult words intentionally and prefers to test understanding in context, do you really believe that one will get a high ACT score with poor vocabulary? This won't happen in ACT or any other similar English tests. Vocabulary isn't only the base of language, and even the base of thought. Different tests have different characteristics; that's true. But for high score hunters, all language tests need strong vocabulary. This is why high school students have to spend lots of time to build vocabulary in ACT preparation. Millions of high school students take ACT test every year and they actually have different goals: some are expecting to apply for top universities, like Harvard or Stanford; some are planning to get admissions of local colleges. They indeed don’t need to have the same vocabulary level, and to do the same vocabulary building. However, either large or small, for serious test takers have to prepare own ACT vocabulary. This web site is trying to meet with students' diverse requirements for separate levels. We believe most of ACT test vocabulary builders will find out useful stuffs and enjoy their great features in test preparing. Word lists are the core to build ACT vocabulary. We collect 3 word lists there to meet with requirements of different test takers. Each of them is integrated with exercises, available to print flashcards, and with normal definitions. Word lists aren't sufficient for some test takers to review and enhance ACT vocabulary. They need various tools to improve performance of reviewing and studying. Web app is one of them. Web apps are based on Internet and run on all devices that have standard browser. It can be accessed anytime and anywhere through Internet, convenient and efficient. 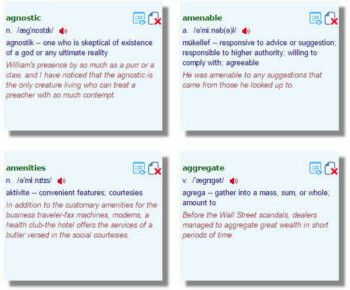 Here we recommend 4 popular ACT vocabulary web apps. This is a very handy and straight ACT vocabulary test tool with pure web technology. You can test ACT words online any time. The random single choice exercise is one of the easiest ways to evaluate your ACT vocabulary level. It's a game style app. Because it produces a random test sheet every time, you cannot accumulate new words systemically with it; however it’s a convenient tool to check your vocabulary preparation and progress. Every ACT test takers are hoping to have a better score. Building a stronger vocabulary just before the test helps very much to get higher rank. This app includes a middle level vocabulary of 1200 words, and integrates planning, studying, and reviewing features to guide students to complete the job within 30 lessons, which are supposed to be done in 30 days. The job isn’t easy for most of ACT test takers except smart and hardworking students. If you plan to use one or two months to enrich ACT vocabulary, this app is definitely deserved to have a look. 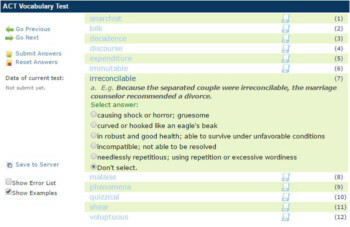 This is a flexible online tool for building English vocabulary. There are 3 ACT word lists are available to load. In fact, you can load other available word lists or even customized word lists. This web app is powered by scientific and intelligent algorithm to schedule the study and review activities so that it will help you own more words within less time. Besides it can combine multiple word lists, merge same words, and skip known words, and also integrates lots of online exercise features. A fantastic tool of ACT vocabulary builders! This web app is based a middle level ACT vocabulary of 2000 words. All words are organized in alphabet order and easy to access. You can create online flashcards on demand. Each flashcard includes explanation, sample sentence, pronunciation, and non-English definition. If your mother language isn't English, there are 20 languages are available to select. It’s a handy tool to study and review ACT vocabulary online. This website also collects and presents related materials, such as tips, experiences, and news, which may help students to prepare ACT test. This section's contents are maintained and updated more frequently than others. The articles usually focus on vocabulary study; meanwhile they may also involve with other ACT topics. The following list shows some tips and experiences. Do you want to make own ACT vocabulary PDF file? Some students try to download ACT vocabulary PDF from internet, but fail to find any satisfied file. Actually, you hardly get an existing vocabulary PDF that exactly matches with your scenario from either online or offline. If you are struggling to produce personalized ACT vocabulary PDF, you can leverage contents of this web site and other free online resources. This article shows you how to do it. Some students used to leverage flashcards to study or review vocabulary. However, it isn’t easy to get a set of flashcards that are fully matched with individual requirement. A few of them write a set of flashcards by self. It’s practical but costs too much time. This article shows how to customize own ACT flashcards with free resources of this website. Building vocabulary is a hard journey. Short practise or quiz helps to check progress and avoids boring on repeatedly memorizing. 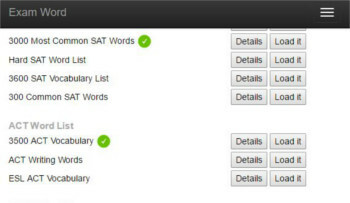 All ACT word lists in the website have built-in single choice exercises. The test sheet is produced dynamically based on specified scope. It is an online and interactive tool to evaluate your vocabulary level. This article shows you how to trigger these quizzes.